Four writers receive an anonymous email telling them they are responsible for a suicide. As a consequence, each must submit a short story for judgement online. Little information is given except that this is a competition with a difference - the three losing writers will die. Non-compliance is not an option. At first they wonder if it's some kind of unfunny joke, but each comes to the conclusion that they may as well enter... just in case. They submit their stories and they await their fate. Was it just a prank or do their lives really hang in the balance? 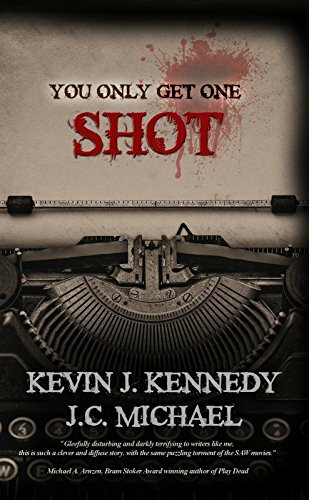 I thought You Only Get One Shot was a cleverly constructed novella. The idea of using a writing competition as a means to link four separate short stories together was highly original and satisfying. The suspense was handled extremely well and I had no idea who, or in fact if anyone, would come out on top. It was very creepy throughout with an undercurrent of uneasiness not knowing what direction it was going to take. The epilogue was ingenious and brought the book full-circle and to an unexpected conclusion. My thanks to author Kevin J. Kennedy for providing a copy of this book.